The Canoe~Angler -- THIS IS NOT A STEP! The Canoe~Angler is sturdy, but please avoid the temptation to stand or sit on it! The tray is molded from durable, high density polyethylene (HDPE) for a seamless contour plus weather and UV protection. 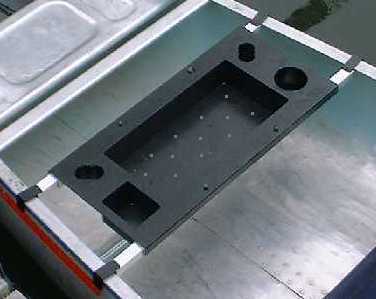 The square aluminum tubing frame is lightweight and corrosion resistant. The gunwale clamps fit easily over gunwales even up to 2 inches wide! The spring-action, telescoping arms adjust to fit a variety of canoe widths* and positions: In front of the rear seat, behind the front seat, or anywhere in between! 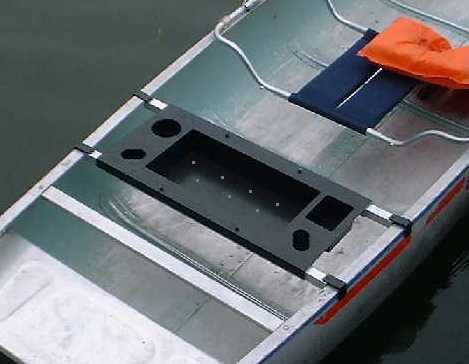 The "Nose Adapter" - for mounting your Canoe~Angler on the front (nose) of the canoe to fish facing foward. Canoe~Angler home Price & Ordering Info Wright Direction home Email Us!